The modern support on the back of the first copper plate bears several adhesive labels referring to the London gallery of Harari & Johns, to Sotheby's Los Angeles, to Sotheby's New York, and to an exhibition which was held in Paris, New York, London, Milan, and Frankfurt at the time when the painting still belonged to Sotheby's auction house, presumably 1990. The paintings are not in outstandingly good condition. 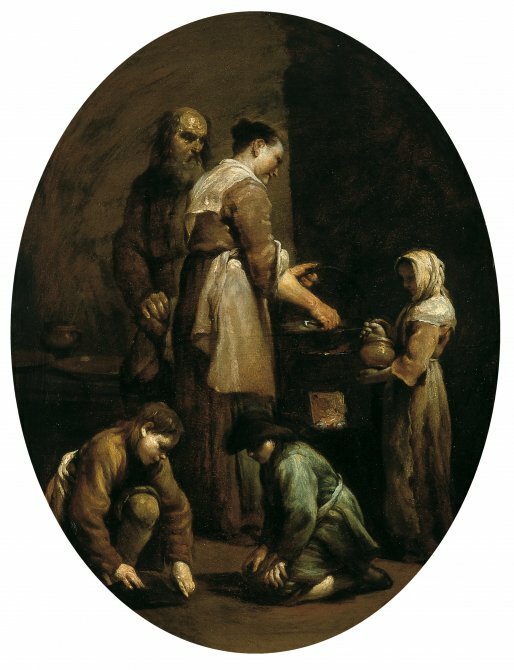 There is considerable restoration to the dark parts of the background of the first painting, specifically in the hair of the woman and the face of the child on the right, also the beard of the man and the coat over the woman's back where parallel strips of paint are missing, the face of the same woman, and the eyes of the old man. More paint is obviously missing from the shoe of the boy leaning over in the foreground on the right. The condition of the pendant painting is better. The shaded part of the face of the central figure, a considerable portion of the lighted cheek, and the hand have all been restored, as has a good part of the background above, the mane of the donkey in the background, the muzzle of the other animal, the left hand of the youth on the left, the hat, a section of the face, the lower part of the coat and of the apron (below the line of the donkey's muzzle). It is possible to see the cross-shaped outline of the old frame on the back of the first copper-plate. This gives good grounds for thinking that Crespi's pair of pictures were originally of rectangular format since that sort of frame is more typical for such a format. Furthermore, the technical analysis supplied by Ubaldo Sedano during his study of the pictures in the restoration studio of the Museo Thyssen-Bornemisza in Madrid corresponds to the views expressed earlier by John T. Spike concerning the apparent improbability of the oval format, such that the Interior with a Family of Peasants gives the appearance of "a study in disguised geometry" while the other picture "in no way conforms to its oval format". The most persuasive dating for these charming copper plates should coincide, as Spike himself had earlier suggested, with the time at which the Bolognese artist was most active as a genre painter, inspired by his stay in Florence at the court of the Grand Prince Ferdinand de'Medici in 1709 when he had the time to study the historical precedent of the works of the Bamboccianti. It is noteworthy that Crespi approached these themes from the lives of the poor without the any social prejudice and without any intention to satirise or deride, in contrast to the so-called realist Lombard painting of the decades to come. His attitude here is also quite different to that displayed in the series of explicitly satirical engravings of the episodes from Boccaccio's Bertoldo, Bertoldino, and Cacasenno. Quite apart from the likelihood of the chronology being proposed for the Thyssen pair, it is quite obvious that the compactness of the depiction and the firm, solid brushwork imply a much earlier date for these pictures than for other subjects of this kind. For example, the pair of small oval canvases (45.5 x 34.5 and 46 x 35 respectively) in the Hermitage of Flirting Peasants and The Importunate Lover painted with greater decision and, apparently instantaneous approach to composition, leading Merriman to suggest a date of around 1730. Shortly before these works, in 1728-29, and on a larger scale, Crespi painted the figure of the old man who appears in the present interior scene as an onlooker at the extreme left of the altarpiece of Saint Andrew Adoring the Cross for the parish church of San Paolo d'Argon, near Bergamo. Much earlier, possibly the 1700s according to Spike this figure appears as Zacharius, with a thinner head of hair, in the Holy Family in the Ganz Collection in London. We can legitimately detect thematic and morphological influence from the Florentine work of Crespi, executed at what is presumed to be the time when the two plates in the Carmen Thyssen-Bornemisza Collection were produced, whether these were executed in loco or sent to Crespi's illustrious patron just before or after Crespi's visits to Florence of 1708 and 1709. 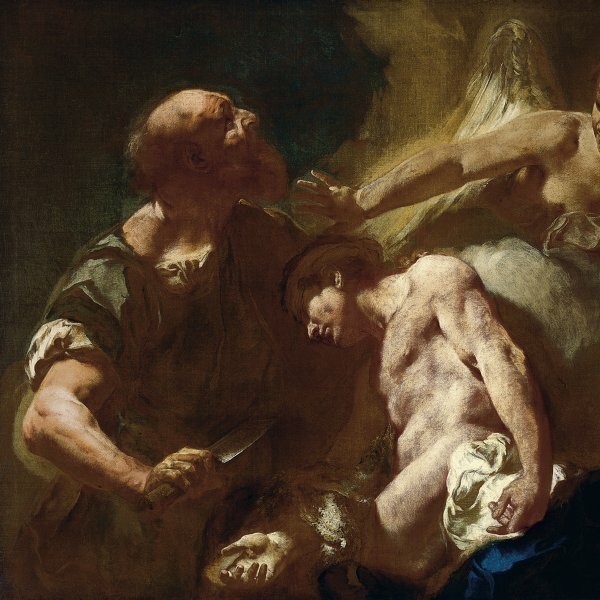 Among the pictures made for the Grand Prince mentioned by Luigi Crespi (1769, p. 211) in his biography of his father (some of which have not been traced), one might be struck by the reference to a painting with "some boys who play cappelletto", which is precisely the game being played by the two boys in the Thyssen Interior with a Family of Peasants, and it is hard to resist the temptation to identify the pair here exhibited with two of the "various copper plates that one sees in the gallery". In one of Crespi's Florentine masterpieces, the Massacre of the Innocents of the Uffizi (1706), which the artist brought in person to Ferdinand, the last woman on the right in the foreground is a clear source for the woman cooking in the Thyssen plate, although only with regard to pose, since the bold and strongly-contrasting colour and the livid green of the skin of the woman in the Uffizi painting have little in common with the sunny atmosphere and the earthy colours of the housewife in this little slice of domestic peasant life. With regard to the other copper panel, one might consider the boy at the centre to whom the donkey is entrusted as an adaptation of the famous and almost equally frontal Portrait of a Boy in the Museo Civico d'Arte Medievale e Moderna of Modena (Campori bequest). However, the slow tempo of the composition of these two serene episodes of popular life means that they can be considered -albeit on a humbler level- alongside that masterpiece (among the many surviving by this great Bolognese painter), the Courtyard Scene in the Pinacoteca Nazionale of Bologna, a work which in every way anticipates the realism of Ceruti in Brescia. The three pictures have a shared source (along with others by the artist) in the lucid brightness and the almost frozen motion that are the perquisites of 17th-century Dutch genre painting, which Crespi came to know in Florence. 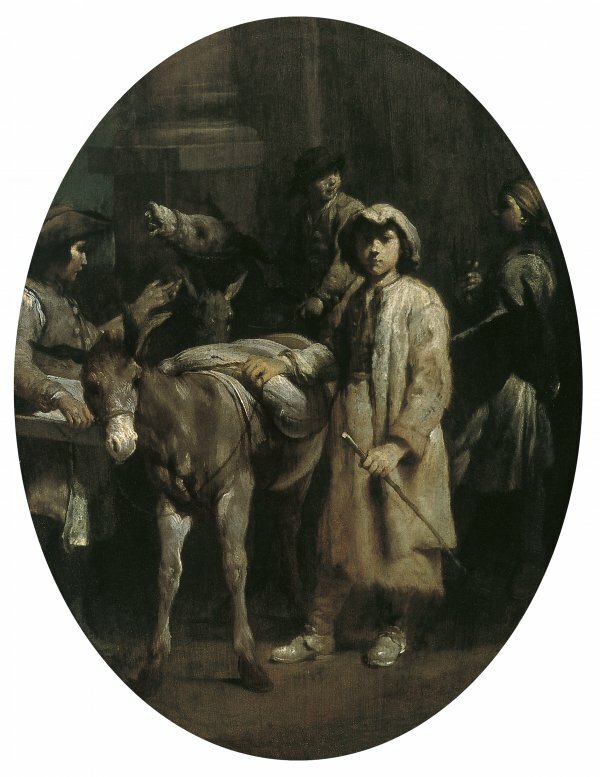 Thus, the urinating boy in the Bolognese canvas and, for instance, the boy on the right of the Interior with a Family of Peasants undoubtedly conform -admittedly, de-contextualised- to those typically used by Sweerts or Dujardin or De Hooch (for example, A Soldier with Dead Birds and other Figures in a Stable, London, National Gallery, inv. 3881 in which the seated boy, in profile can be compared to the one kneeling in an analogous position in the Crespi copper-plate).